Battle of the Saints – 45th One Day Encounter. SPC – 175 for the loss of 5 wickets in 41 Overs (Dinith Anjula 32; Shannon Fernando 20; Santhush Gunathilaka 52; Shivan Perera 24 n.o. 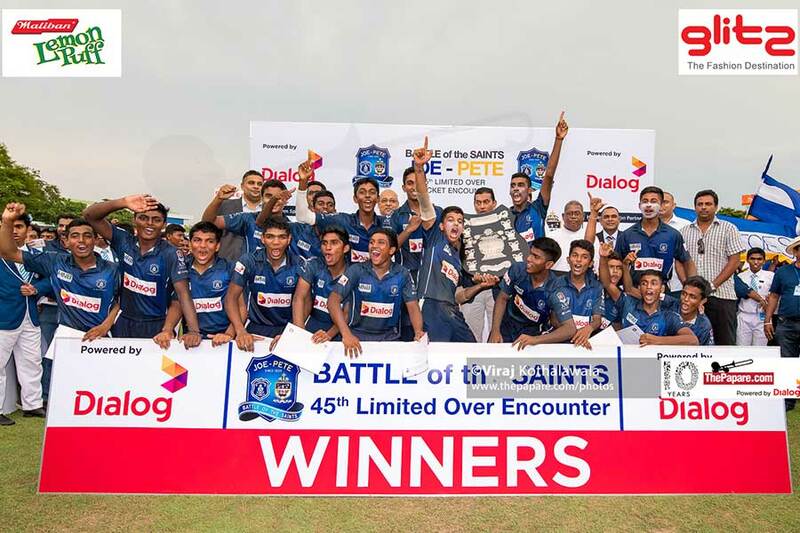 St. Joseph’s College, inspired by a brilliant seventh wicket partnership between Lakshan Gamage and Sachintha Mahindasinghe, beat arch-rivals St. Peter’s College by 10 runs in the Battle of the Saints 45th limited overs encounter which was decided by the DLS method today SSC grounds. With both Captains needing to bat first the Josephian skipper Ashein Daniel won the toss and got the advantage. The start for the Josephians was not the greatest as they would have expected as the Peterites’ opening fast bowlers wreaked havoc on the Maradana lads. The Josephians were soon reduced to 61/6 by the 19th over. Left arm seamer Tariq Saboor was brilliant with the new ball as he took two wickets in his opening spell. 1 wicket while half-centurions in the 2-Day encounter, both Dilesh Perera and Dineth Jayakody were sent off through run out’s. Apart from the 1 wicket in his opening spell, Gunatilake also held on to a brilliant catch to dismiss Wellalage off the bowling of off-spinner Ruvin Seneviratne. Following the early Lakshan Gamage and Sachintha Mahindasinghe put on an excellent partnership to revive the Josephian innings. The duo added 179 runs for the 7th wicket taking their team from 61/6 to a surprising yet commanding 240 by the 48th over. This stand also went past the Joe-Pete One Day record for the highest partnership for any wicket which was set by Peterites Sulakshana Fernando and Manelkar De Silva in 2017 for the 4th wicket. During the record-stand, Lakshan Gamage scored a breathtaking century in just 89 included 7 boundaries and 2 big sixes. His partner Mahindasinghe faced 104 deliveries for his 74 runs and played a vital supporting role to Gamage. 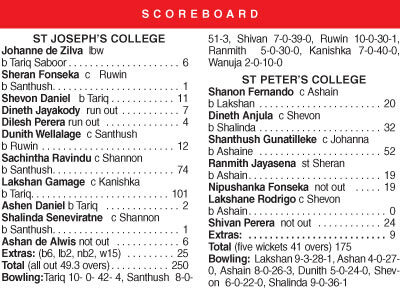 Despite late blows from the Peterite towards the end, St. Joseph’s ended on a competitive 250 losing all their in wickets in 49.3 overs. 10 overs with magnificent figures of 4/42 while Gunatilake’s figures read as 3/51. The Peterite run-chase got off to a slow start as the openers took 8.3 overs to score 29 runs. Wicket-keeper, Shannon Fernando was the first wicket to fall as he was dismissed by fast bowler Gamage for 20. His opening partner Dinith Anjula was also sent back after a 49-run 2nd wicket stand as left-arm spinner Shalinda Seneviratne dismissed him for 32. Continuing the good form, he had during the 2nd wicket partnership, Gunatilake added 45 more runs together with skipper Ranmith Jayasena. The best batting pair of St. Peter’s to take the game away from the Joes as they were milking the ball swiftly. When the score was on 123/2 in the 32nd over, Josephain skipper and off spinner Ashein Daniel stepped up to dismiss Gunatilake for 52. In his very next over Daniel struck twice sending both Jayasena and Rodrigo back to the hut. Rodrigo the one-day encounter after being left out in the two-day, got out in the very first ball he faced trying to clear the long-on boundary. Vice-Captain Nipunaka Fonseka and Shivan Perera together were involved in an unbeaten 45-run 6th wicket stand when play was stopped due to bad light. The duo during their stay in the middle tried to inch towards the DLS par score as the skies grew darker gradually. Unfortunately for the Peterites, they were short of 10 runs when play was stopped. With this win, the Josephians will go further up in the series tally with 23 wins against the 20 wins recorded by their opponents.